Recorded at Glasgow's City Halls, Martyn Brabbins conducts the BBC Scottish Symphony Orchestra in works by John McCabe, Sally Beamish, Anthony Payne and James MacMillan. Ivan Hewett presents a concert recorded earlier this evening at Glasgow's City Halls by the BBC Scottish Symphony Orchestra with conductor Martyn Brabbins. Robert Worby previews next week's Festival of Contemporary Music for All (CoMA) which takes place across the whole of the UK, and in Modern Muses, New York-based composer Nico Muhly and British countertenor Iestyn Davies talk about not only their musical collaborations, including Muhly's Richard III-inspired Old Bones but also a close personal friendship, both of which they sustain despite being based thousands of miles apart. 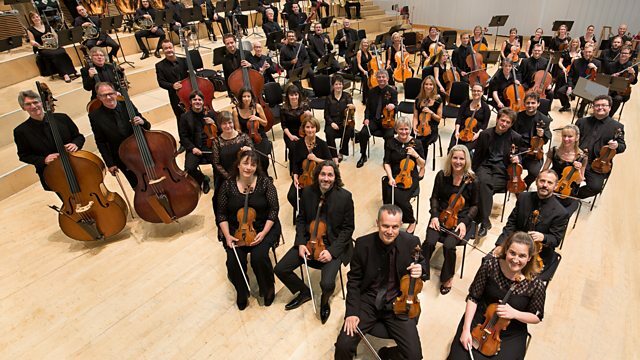 Orchestra: BBC Scottish S O. Performer: Robert Cohen. Orchestra: BBC Scottish S O. Conductor: Martyn Brabbins. Orchestra: BBC Scottish S O. Conductor: Martyn Brabbins. Choir: Glasgow Chamber Choir. Orchestra: BBC Scottish S O. Conductor: Martyn Brabbins. Performer: London Sinfonietta. Performer: Gregory Rose.